I love reading poetry and I often think that those who are gifted with the heart and soul of a poet are blessed indeed. I'm always enthralled by the way that poets weave words into something beautiful that can touch us so deeply. In her new poetry collection, Butterflies Dance in the Rain, poet Colette V. Paul gives readers a moving testimony which covers the subjects of love, tragedy, self-discovery, racism, the environment, and a variety of universal themes. Ms. Paul definitely has a way with words. She offers readers an opportunity to see the world through her eyes, while still striking a chord of recognition in us, as we relate to what she is saying. This is a very personal collection that unflinchingly explores the poet's innermost thoughts and as a reader I came away very appreciative of her candor and realness. This collection begins with "Dear God Letter", which is a very personal plea that many of us can relate to in our own lives. 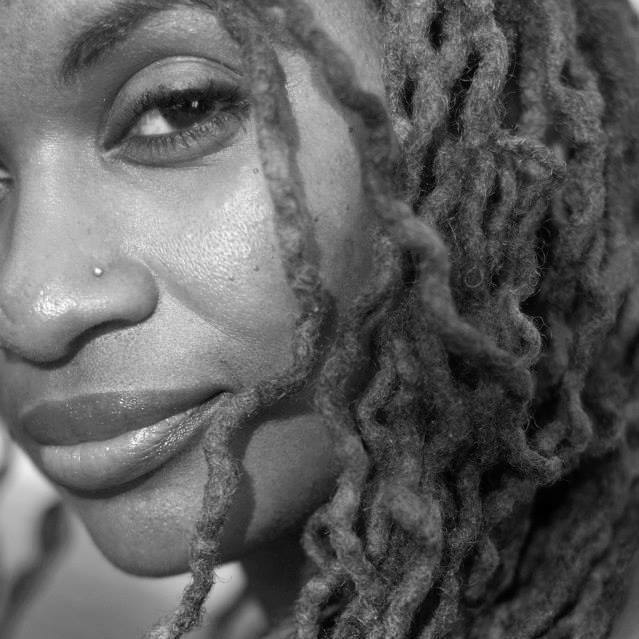 Ms. Paul asks for more guidance and clarity in her life in this simple and honest poem. And give me the courage to walk the path and make it happen. In "Music is the Life" the poet takes us on a journey with her through her love of music and lets us feel how it has elevated her life. Ms. Paul's writing skills are on full display in this lyrical poem as her words have a musicality to them. There is of course no musical accompaniment, but the music is still there laced within her words. "Mystical Nights" is another atmospheric poem that recalls the romance associated with trains and the unknown destinations to which they travel. Ms. Paul beautifully describes the sights and sounds and ponders these mystical trains as vehicles to her own destiny. The trains will take me to my dreams on a world-class ride. A very compelling selection is the aptly-titled "For What?". This is a poem that is haunting in its narrative about the injustices suffered in America throughout our history and it's timely because of the continued injustices that we witness in the news each day. It is an account of a mother who wants to protect her son from the noose by sacrificing herself to no avail. She calls her tormenters out strongly and drops some truth on them that echoes through the ages. This is a powerful poem. I thoroughly enjoyed the whole collection. There are so many high points within these pages that it is hard to pick a favorite. This is a beautifully written collection that will be a pleasure to revisit over and over again for years to come. 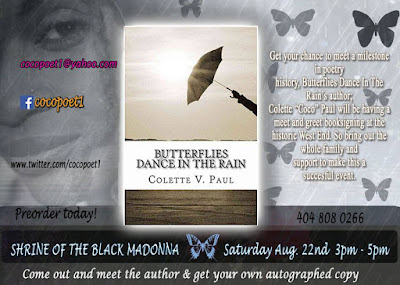 Colette V. Paul will be signing copies of her debut poetry book on Saturday, August 22nd from 3pm to 5pm at the Shrine of the Black Madonna Culture Center in Atlanta's Historic West End. 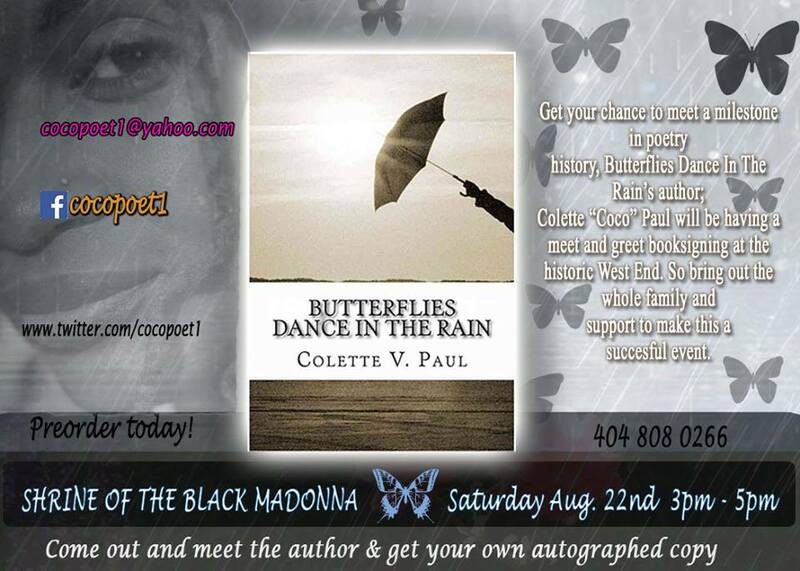 Please go by and pick up your very own autographed copy! 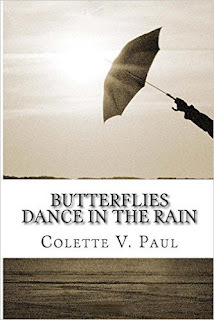 If you're not able to attend the signing, Butterfiles Dance in the Rain is available on Amazon here. And here's a special treat...Ms. Paul performs selections from her book. Enjoy!